If you're a country music aficionado like us, chances are you've had the 2018 CMT Music Awards marked on your calendar since the nominations were announced earlier this month. The latest and greatest in the genre will hit the stage at the Bridgestone Arena in Nashville on June 6 to celebrate all the achievements made in country music this year. Legends such as Blake Shelton, Chris Stapleton, Kelsea Ballerini, and Sam Hunt will perform live, and you better believe we'll be tuning in to catch all the action from our living room. 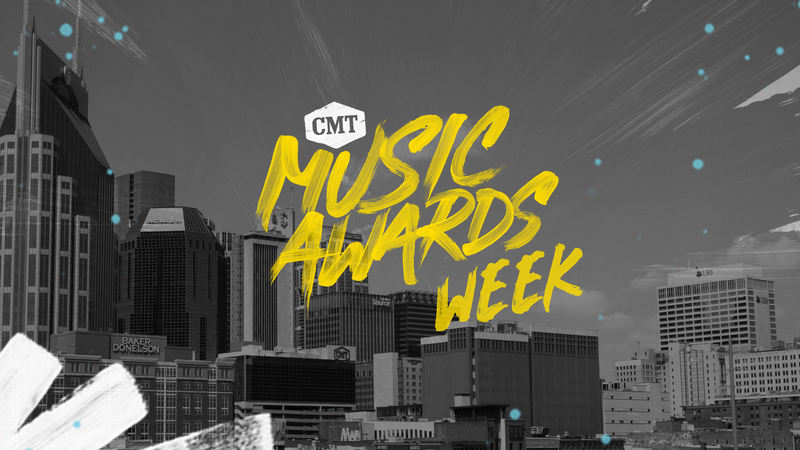 In addition to the annual awards show, CMT decided to kick it into high gear this year by completely taking over the city of Nashville in the days leading up to the event, turning it into a live music paradise for the people of Music City USA. From the two-day Bar-S Block Party held at Schermerhorn Symphony Center Plaza to the CMT Crossroads Live! show going down on on lower Broadway, June 3 through June 6 will be chock full of live performances. From sets from LANCO to Delta Rae to Bailey Bryan, this will be a week of live music you won't want to miss. Oh, and did we mention that it's totally free? Check out 14 of the shows we're most amped for below, then make sure to RSVP to them on Bandsintown! 2018 looks good on Cassadee Pope. After taking home the crown in 2012 on Season Three of The Voice, the powerhouse vocalist dropped two albums, toured with artists like Tim McGraw and Dierks Bentley, and earned a GRAMMY nod. No big deal. This year, the singer-songwriter hit it out of the park with her first release since 2016, “Take You Home”. If this is any indication of what’s to come, sign us up. Had Walker Hayes’ “You Broke Up With Me” on rotation since his album, boom, dropped last December? Same. The record, which reached No. 6 on Billboard’s Top Country Albums chart, became an instant classic, thanks in large part to his honest lyricism and heartfelt delivery. Make sure to add this one to your CMT to-do list, STAT. Fusing elements of blues, pop, and rock to make one-of-a-kind country songs, LANCO are truly in their own lane. Their debut album, Hallelujah Nights, is filled with romantic gems like “Born To Love You”, “Pick You Up”, and “Greatest Love Story” (which just surpassed the 74 million plays mark on Spotify). Do yourself a favor and bring your +1 to the quintet’s show for an unforgettable night. The future is blindingly bright for rising star Devin Dawson. If you’ve had the chance to catch the California native’s live show before, you can attest—he knows how to work a room. Hearing “All On Me” in the flesh? Goals. Writer, vocalist, and instrumentalist, Garrett Moisher is the heartfelt newcomer you need to be paying attention to. Songs like “Coffee Shop” and “Urban Angel” exemplify this to a T, solidifying him as a creative voice to be reckoned with. Pro tip: catch this set before he blows up. Whether you recognize him from movies like The UnMiracle or 90 Minutes in Heaven, or have stumbled upon his track “Always Been You”, chances are you’ve heard of Trevor Martin if you live in the Nashville area. An actor, singer, and songwriter, this triple threat is sure to bring his on camera charisma to the stage on Monday. There’s few franchises we love as much as CMT Crossroads. Pairing country music stars with artists from differing genres, the program is a unique way to bring together the industries elite. Previous couplings include Taylor Swift and Def Leppard, The Band Perry and Fall Out Boy, and Kacey Musgraves and Katy Perry. On Tuesday, June 5, music lovers in Nashville will have the chance to catch R&B icon Leon Bridges and global breakthrough Country star Luke Combs together on one stage. Alternating between performing one another's songs and dueting, this will be a night for the books. Together, Alyssa Bonagura and Ruby Stewart are The Sisterhood. Inspired by West Coast folk and ‘70s rock'n'roll, their music has a timeless feel, reminiscent of legends like Fleetwood Mac and Joni Mitchell. Press play on tracks like “Gasoline Alley” and “Tenderize My Heart” off their self-titled debut EP to see what we mean. We fell for Bailey Bryan the first time we heard her iconic cover of Drake’s track, “Too Good”. Whether she’s flipping songs on their head or performing original material, the Bandsintown Big Breaker adds her signature flair to everything she touches. Stop by this live set for guaranteed goosebumps. It’s hard not to be obsessed with Kelleigh Bannen. Ever since her addictive song “Famous” was released in 2014, she’s dropped a ton of singles leading up to the release of her debut EP, Cheap Sunglasses. Bring your squad for a day to remember. ICYMI: Carly Pearce’s 2017 album, Every Little Thing, was the highest charting solo female debut since July 2015, making her one of three women to accomplish said feat in the past 12 years. There’s a reason for that, check out songs like “Hide The Wine” and “If My Name Was Whiskey” for further proof. When Durham, North Carolina’s Delta Rae dropped “Bottom of the River”, it united fans of every genre under the sun. Brimming with powerful vocals, bass drums, segmented hand claps, and yes, clashing chains, the track launched them to superstardom, and eventually earned them a spot on Forbes' 30 Under 30 list. This one will be packed, so get there early. Before discovering country music, Tyler Rich fell in love with the sounds of Creedence Clearwater Revival, Michael Jackson, and Tom Petty. This shapes the way he approaches his craft, instilling in him the need strong instrumentation and catchy hooks. Check out his new ear candy, “The Difference”, to see what we mean. Crafting optimistic tunes shaped by the trials and tribulations of daily life, Morgan Evans is the artist 2018 needs. The Australian singer-songwriter has a knack for inspiring concert-goers with his live performances, so catch his set at Bar-S Block Party for a pick-me-up you won’t forget.